Major General Don Richard Ostrander is commander of the Office of Aerospace Research which is responsible for planning, programming and managing the U.S. Air Force research program. 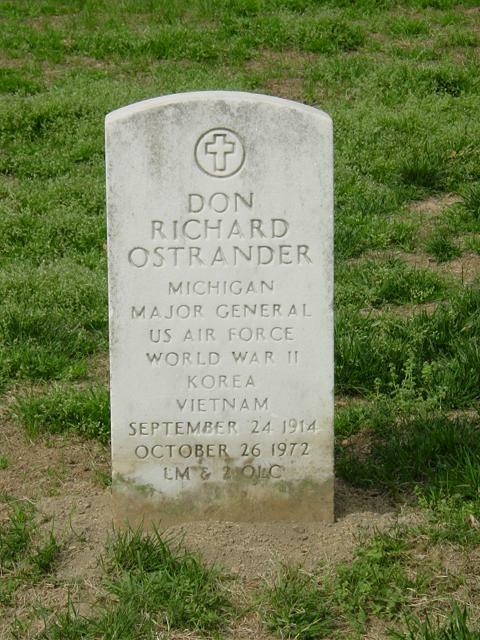 General Ostrander was born in Stockbridge, Michigan, attended local schools and studied engineering at Western State College; Michigan. He entered the U.S. Military Academy at West Point in June 1933 and graduated in 1937. In July 1944 the general returned to the United States and was assigned to Headquarters AAFTAC, Orlando, Fla., as chief, Auto and Munitions Branch and later served as director of materiel and services. General Ostrander attended the Command and General Staff School at Fort Leavenworth, Kansas, from March 1946 until graduation in July 1946, and then attended the Industrial College of the Armed Forces in Washington, graduating in June 1947. This was followed by a four-year tour at Wright-Patterson Air Force Base, Ohio where the general served as chief, Fire Control Branch, Armament Laboratory and Chief of Plans, Engineering Division, Air Materiel Command. From June 1951 until September 1954 General Ostrander served at Holloman Air Force Base, New Mexico, as deputy commander, 6540th Missile Test Wing. Later when Holloman was redesignated the Holloman Air Development Center, he became commander of this center. The general was then appointed assistant for guided missiles production with the NATO International Staff, Paris, France and in October 1959 returned to the United States as deputy director of Advanced Research Projects Agency, Office of the Secretary of Defense, located in the Pentagon. From October 1959 until August 1961 General Ostrander was director of the Office of Launch Vehicles, National Aeronautics and Space Administration, Washington and in September 1961 became vice commander, Ballistic Systems Division, Air Force Systems Command, Los Angeles, California. In October 1962 General Ostrander assumed command of the Office of Aerospace Research in Washington, D.C.
Military decorations awarded General Ostrander include the Legion of Merit with two oak leaf clusters.